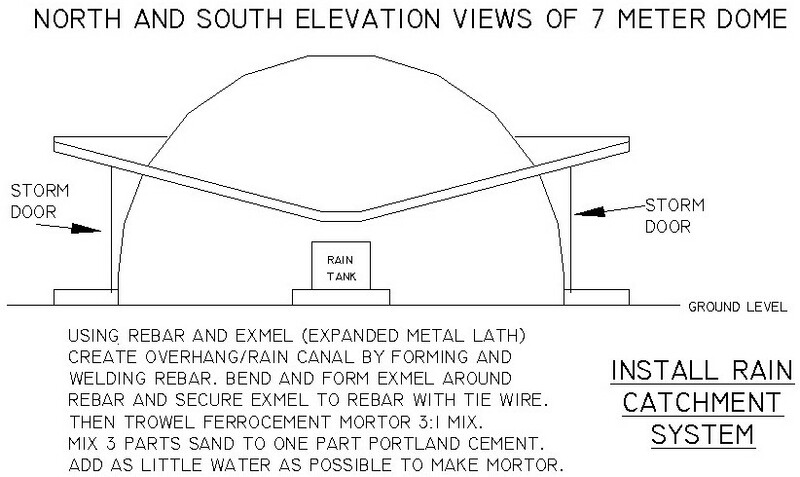 Instructions for building a 7 meter (23 feet) diameter dome. Anyone willing to work to help themselves and others may use these plans. so that we may put your photos & info on this website to benefit more people. to create the dome shape with interwoven sets of parallel arches. You can make a scaffold that basically is a half arch that pivots on a center braced or roped in place post. The tripod stand & scaffold can be a braced post with an arched & pivoting wood or steel trussed ladder. With the pivoting half arch scaffold you can work on the exterior without pushing the surface inward. The hole where the post extends thru the top of the dome will become the apex vent or smoke hole. and provide a matrix for attachment of expanded metal lath, hardware cloth, or more chicken wire. The surface is trowelled with 2:1 mortor mix & water catchment can be integrated into the design. The concrete about one inch thick is embedded and trowelled over chicken wire. 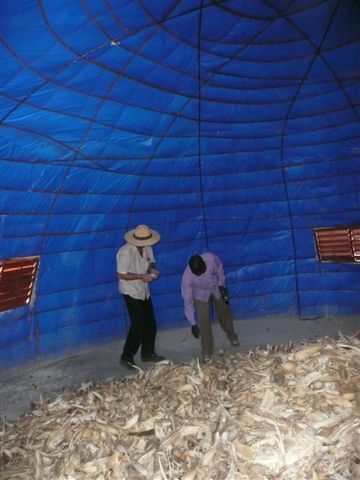 Is being used to store harvested maize. is built as quickly and economically as possible. 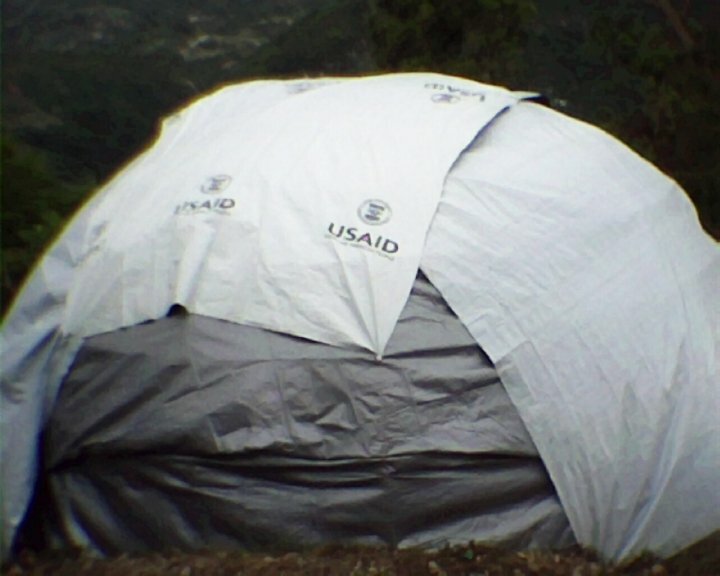 In Haiti and elsewhere many tents are built for emergency shelters. they can be covered with wire and cement and then become permanent, durable and storm tolerant shelters. provides options and a colorful interior finish. 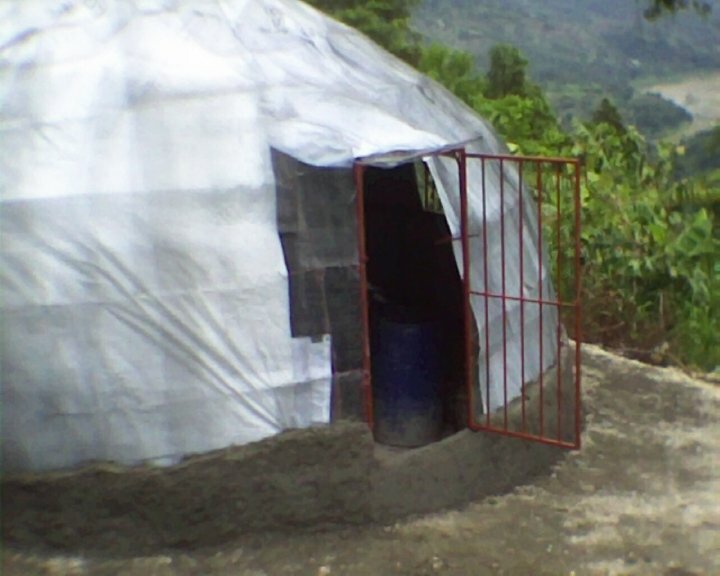 cannot be built as economically as a simple (rebar and tarps) dome tent covered with chicken wire and cement mortor. When a thin layer of cement mortor is trowelled into and over wire mesh it is called ferrocement. Water tanks, boats, and shelters have been built in many places around the world using ferrocement building methods. There is a lot of information elsewhere on the internet about ferrocement shelters. has been developed because of the great need for low cost substantial shelters. without the need for a lot of money or reliance on any particular manufacturing company. We know that when disasters strike there is an immediate need for shelter. Afterwards, the tent shelters need to be transformed into substantial homes. Building low cost and durable shelters and homes is the purpose of the Birdcage Dome. and then cover it with chicken wire and a trowelled on cement mortor mixture. We have found it quite easy to stretch the tarps and chicken wire mesh tightly over the rebar dome. tarps (that are supported by the rebar dome) the dome tent is made more secure. the tarps will continue to be a waterproof tent, if the tarps are carefully lapped and stretched. Wire, twine, string, or lightweight ropes are used to secure the tarps to the rebar birdcage dome. Additional chicken wire can be attached to the secured chicken wire. Then the surface can be rough trowelled with a first layer of cement mortor. Optionally, a second layer chicken wire and--then a second coat of cement mortor can be added. Two layers of chicken wire and cement mortor would ensure a more substantial and leak free dome. The first layer of wire mesh and trowelled on cement mortor could often be enough. A second layer of wire mesh and trowelled on cement mortor would repair the dome and ensure a more durable surface. and taught birdcage dome building. 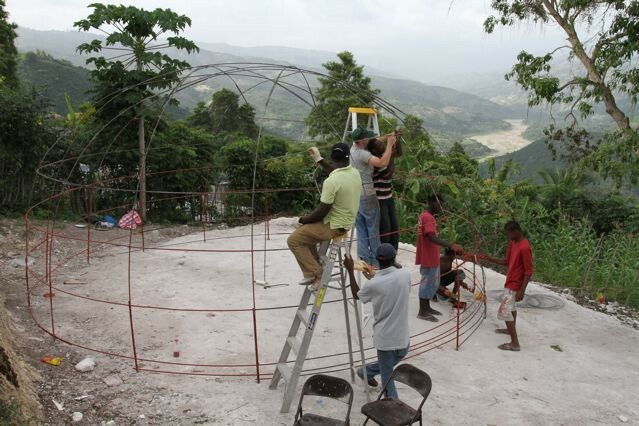 This is a birdcage dome is being built in Haiti by Haitians with materials purchased in Haiti. 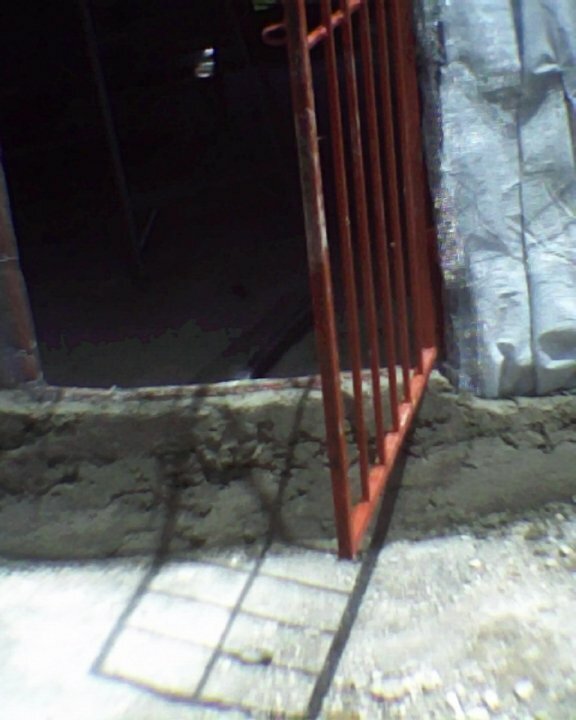 This rebar dome frame was built and painted in two days. Locally only (bent in half) 1/2 inch dia. by 30 feet long rebar was available. So, the rebar was made straight (by unbending and using hammers) and cut in half. and spliced with 45" overlaps to make the interwoven arches forming the dome. Then, the horizontal rings were added and the rebar was painted to prevent rusting. Windows, doors, an outside covering, and a level concrete floor are being added. and covered with tarps, metal mesh and trowelled on ferrocement concrete. DensDeck Prime Roof Board, and elastomeric waterproofing. 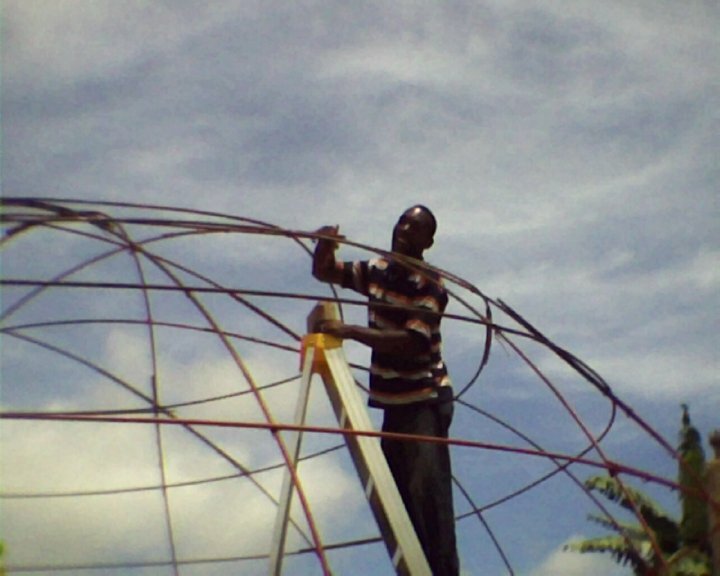 There is a way to build a smaller 7 meter (23 feet) diameter dome home without using any type of dome kit. 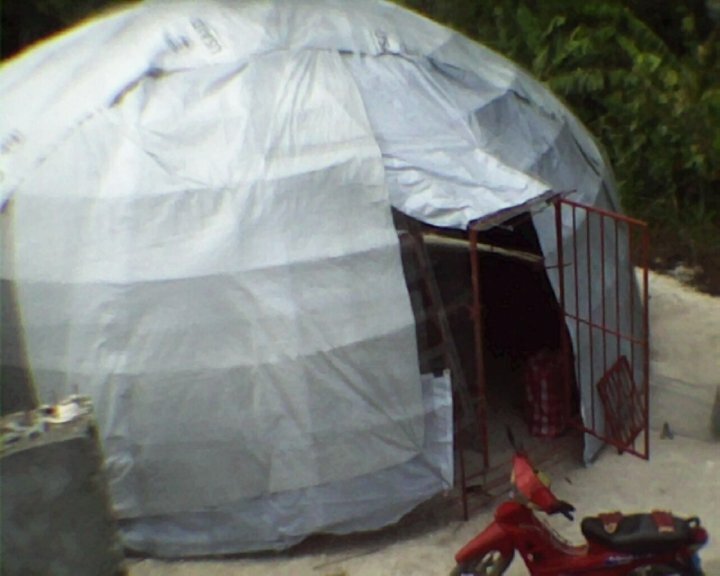 A do-it-yourself dome home built using only rebar, tarps, metal mesh, and mortor is very economical. 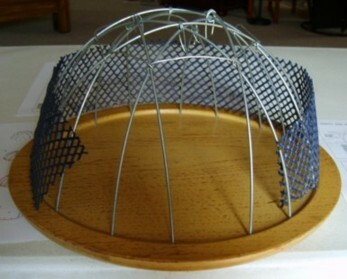 We call it the "birdcage dome" as you begin with a birdcage made with steel rebar. 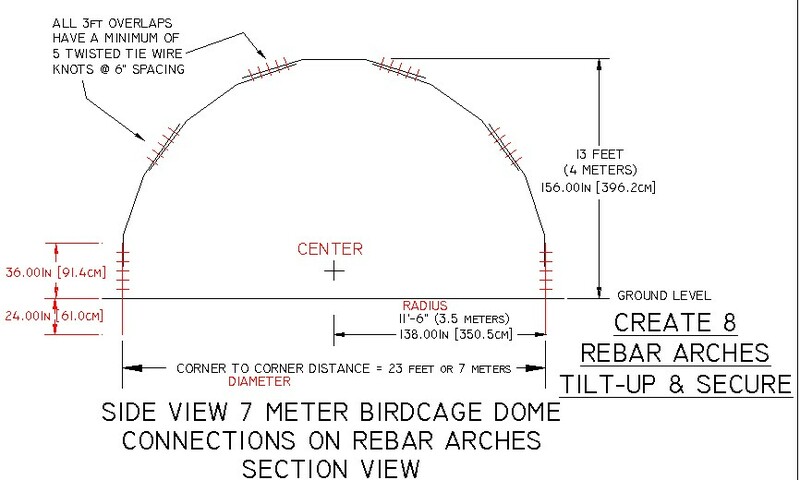 The birdcage dome can be built very economically on the ground or on a raised mesa base. covered with wire mesh and trowelled on concrete. 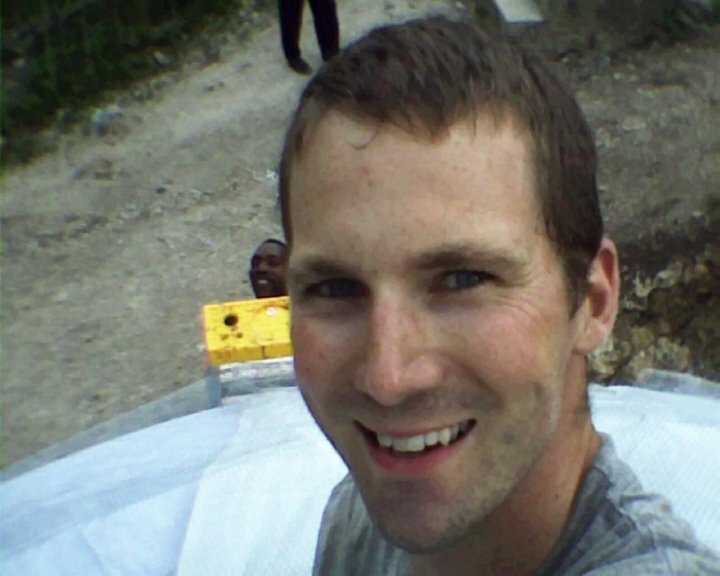 because the necessary construction materials are available in Haiti. who need substantial and safe low cost homes in Haiti and elsewhere. 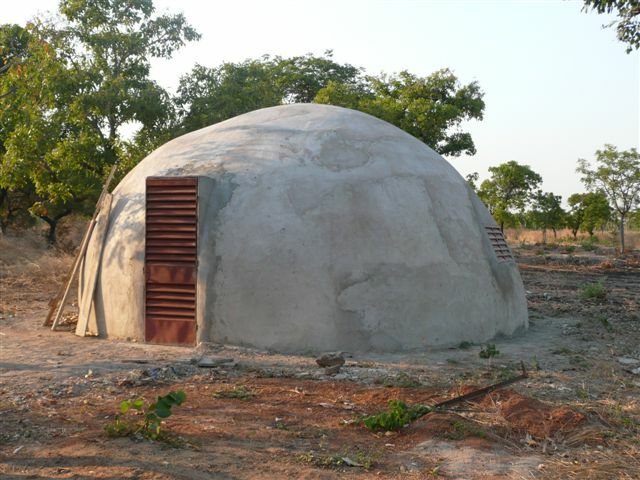 this dome building method can be used to build low cost and functional dome homes. Cement and sand mortor over wire mesh is called ferrocement. Ferrocement concrete can be used to make boats, water tanks, and dome homes. Ferrocement is cement mortor that is trowelled onto metal wire mesh. when it is formed in a curved shape and reinforced with wire mesh. when it is formed to make a wire mesh reinforced concrete dome. 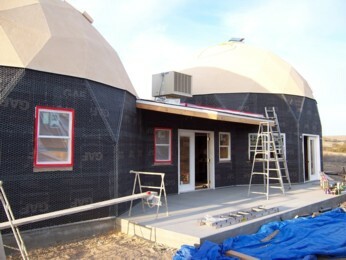 elastomeric covered composite cement panels on the upper part of the domes. wire mesh and trowelled on stucco cement mortor (ferrocement). of chicken wire mesh, or, one layer of expanded metal lath (diamond metal mesh). Hardware cloth (wire mesh) with 1/4 inch and/or 1/2 inch squares can also be used. This is Wil Fidroeff, developer of the Birdcage Dome building alternative. 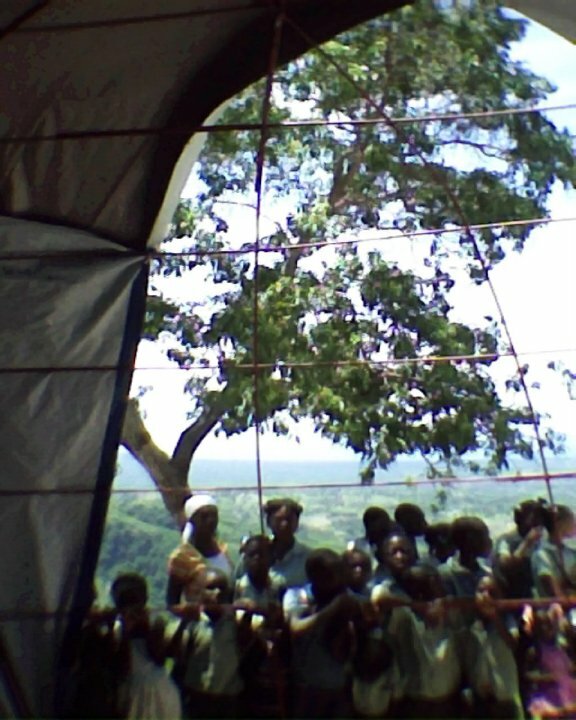 The idea of the Birdcage Dome came just after the earthquake in Haiti. 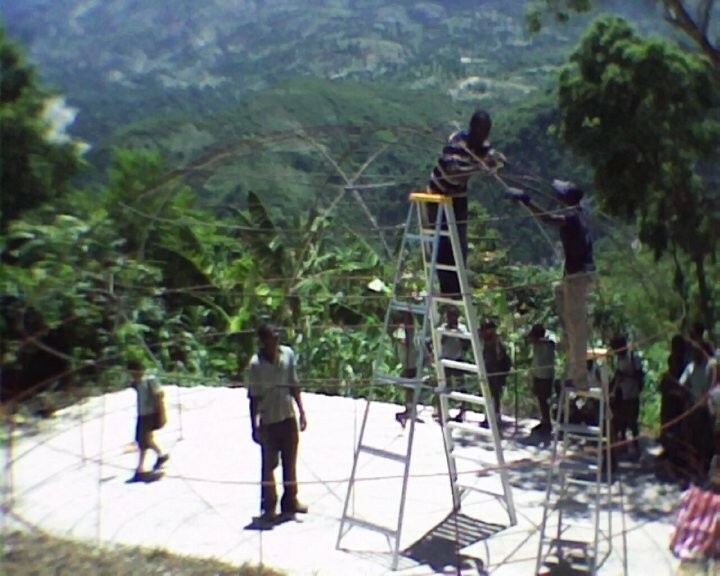 There were many tents being built in Haiti. My initial thought was to design a dome that would first of all be quickly useable. The trick to the birdcage dome is the way the initial rebar arches are woven. first two sets of parallel arches are installed the intersect at 90 degrees. Then do it again with two more parallel sets of arches rotated 45 degrees from the first two sets. and spliced to the lower end of a rebar arch. The arches are installed in parallel sets in order to accomodate doors and windows between the parallel rebars. Then concentric circles of rebar are attached to the outside of the interwoven rebar arches. The doors and windows can be cut out after the rebar birdcage is completed. We have found that a radius of 3.5 meters or 11.5 feet works well with 1/2" diameter rebar. (depending on soil conditions and climate). Paint the rebar stakes with a good metal primer before you drive them into the ground. Or use epoxy coated rebar if available. Also paint all the rebar making the birdcage, if you plan to leave the rebar exposed. We put the tarps on the exterior so that the shelter is immediately useable. The tarps also provide an interior finish an a place to stuff clothes, blankets, etc..
next to the ground to prevent piercing the tarps. Use 24" wide chicken wire that comes in 150 foot long rolls. you can cut the rolls in half at 75 feet and make 2 lengths from each roll. use wire to attach the chicken wire to the bottom ring of rebar. attach the continuous rolls of chicken wire over the tarps in the same pattern as the rebar arches. Then attach more chicken wire or expanded metal lath to cover the exterior surface completely. Then apply mortor by squishing it into the chicken wire or expanded metal lath. it helps if you have used small lapping layers tarps and tied tightly over the rebar birdcage. where you are applying mortor on the outside. This just helps to provide support so the mortor can be applied thinner and more evenly. The thinner you apply the mortor, the better. but too much concrete that is too thick will not be inhibited from cracking by the wire or mesh. The best thickness for the mortor is about 3/4 to one inch or about 2 to 2.5 centimeters. This technique is called ferrocement and is used to build boats and watertanks. No exterior painted on waterproof coating is necessary. Spray or throw water on the exterior surface every few hours for the first couple of days to get a good cure. After 30 days the concrete surface can be climbed on. Put a vent (smoke hole) in the top center if you want to build a fire in the center of the dome. that can be built on the incredible MesaBase, Rock & Block, Floor & Foundation. need to raised above ground level to stay dry inside. and so can the area adjacent the outside of the home. The most economical way to do this is with gravel or rubble. 1. INCREASES FIRE SAFETY BY PREVENTING THE GROWTH OF VEGETATION ADJACENT THE BUILDING. 2. REDUCES THE LOSS OF ENERGY VIA THE PERIMETER OF OF THE CONCRETE FLOOR. 3. RAISES THE BUILDING ABOVE NATURAL GRADE. 4. PREVENTS EROSION ADJACENT THE BUILDING AND CREATES RAINWATER DRAINAGE AREA. 5. INSULATES UNDER THE CONCRETE FLOOR. 6. INSULATES THE GROUND ADJACENT THE BUILDING. 7. PROVIDES A RAISED PERIMETER BORDER AREA. 8. GREATLY REDUCES COST BY REDUCING THE AMOUNT OF NECESSARY CONCRETE. Building A Birdcage dome that can be covered with concrete. 8 interwoven arches create a strong dome and allow for conventional doors and/or windows between parallel arches. Make a model like this one to prove it to yourself or anyone else. When you push down on the wire cage you can feel the strength of the dome. We used 12 gauge fence wire to make this small dome model to prove the concept to ourselves and to others. 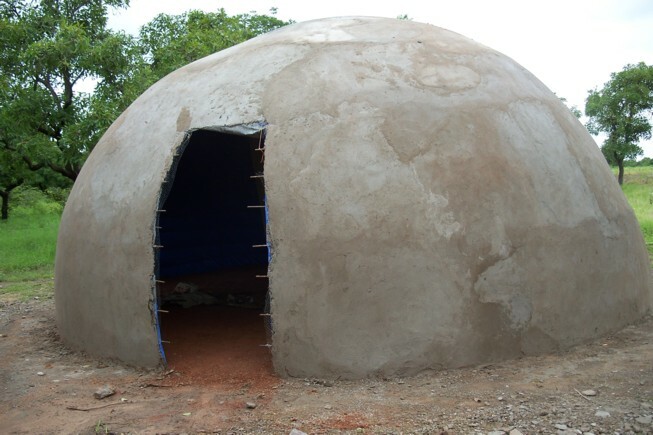 for building steel reinforced concrete dome homes with only common materials and local labor. We offer the following construction information for anyone in need of low-cost and substantial housing. We are hoping to help create both jobs and shelter for folks in need of jobs and shelter. So, read on if you wish to "help others" and "make a job for yourself". At minimum you would need a circular piece of ground that is--23 feet or 7 meters across--(in diameter). 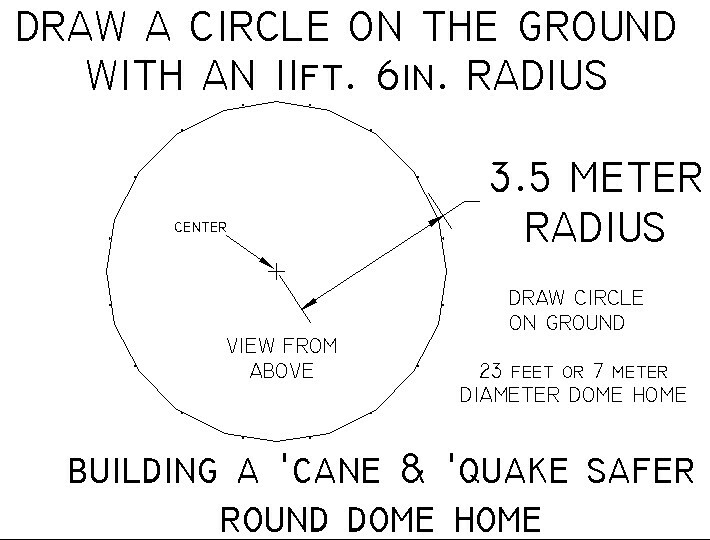 To draw a circle 23 feet in diameter or 7 meters in diameter. and draw a circle on the ground having a radius of 11 feet-6 inches (3.5 meters). small tarps, tie wire, portland cement, sand, and water. 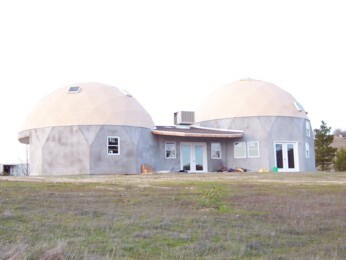 to build low cost and substaintial dome homes. 8ea 10 ft.(3m) lengths of rebar cut in half to make 16 corner posts. 40ea 10ft. 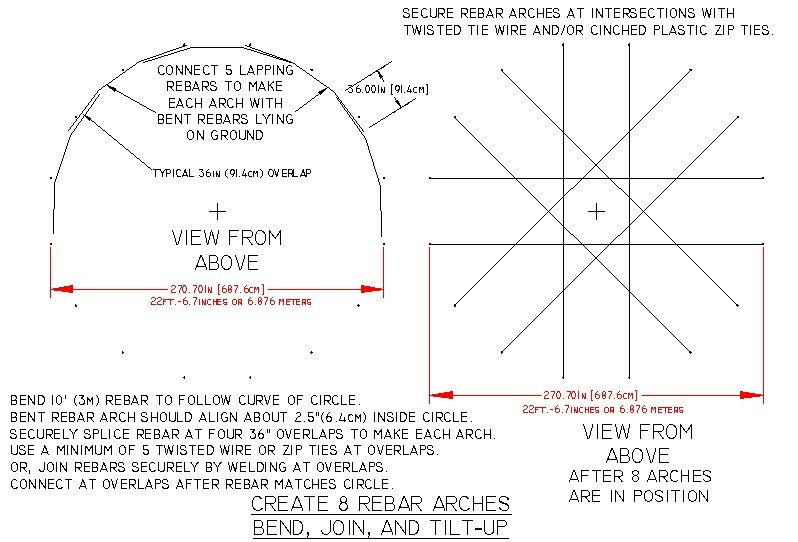 (3m) lengths of rebar to make 8 arches (5 rebars per arch). 50ea 10ft. (3m) lengths of rebar to make horizontal rings that go horizontally around the arches. As a substitute for horizontal rings, 6x6 #10 wire mesh can be used to wrap and lap around the arches. 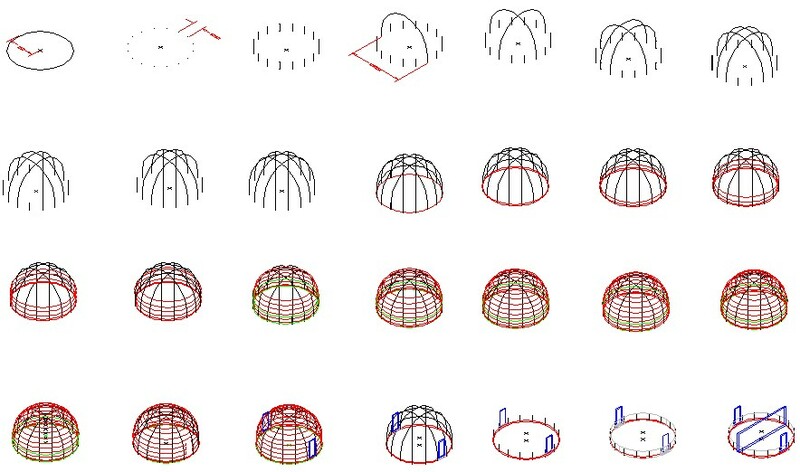 The surface area of the birdcage dome is about 1000 square feet or about 93 square meters. So, you will need about 1500 square feet or about 150 square meters of tarps. The tarps will be stretched tight and lap over the rebar dome. So you will need enough tarps to allow for lots of overlapping. The tarps need to be put on the bottom first and should lap like big shingles to keep the rain out. the four corners of each tarp can be twisted and tied in a knot. Then, galvanized wire or strong rope or nylon string can be tied to the knots and to the dome. Always stretch the tarps tight over the surface of the dome. You will need one layer, 1000sf (93sm) of expanded metal lath (diamond metal mesh). Or, you can use several layers, 3000sf (280sm) of chicken wire. The thickness of the stucco (ferrocement) mortor will vary between 1 and 3 centimeters (1/2 in. to 1 in.). you will need about 20ea 94# bags of #2 portland cement and twice as much sand (40 bags). or even on the top, if little cement is available for whatever reason. Wet the concrete surface often for the first three days and before resuming trowelling work. The top of the windows will be at 7 feet with the sills at 3 feet. Everyone can see out the windows and two can easily share the view out the window. Larger and more windows can also provide more ventilation. If windows are installed the water catchment trough will need to be routed under or over the windows. The following plans assume the use of two outswinging storm doors and no windows. trough/overhang can be a made as small or as large as you wish. A light and large bladed fan near the top of the building could light and cool the interior. A spinning turbine at the top of the dome assists with ventilation when there is breeze outside. Small operable trailer skylights can add additional light and ventilation inside the building. Colorful tarps and painted rebar would be visible on the inside. that would remind one of the lattice inside a Mongolian yurt. The painted steel rebar would be very useful for hanging whatever. and then tilted and slid into place on top of the interlaced arches. The rebar can be connected by "zip-ties" or galvanized wire. Twisted wire connections would need to be made inside the dome to prevent poking holes into the tarps. chicken wire mesh that extends over and under the tarps. leaving enough space for the vent at the top. The chicken wire would be stretched tight and criss cross over the top of the tarps. The lower ends of the chicken wire would be connected to the lowest rebar ring. Then position chicken wire parallel on both sides of each of the doors and windows. Always pull the CHICKEN wire down tight over the top and secure to the lowest bottom rebar ring under the tarps. The exterior can be made permanent using concrete mortor over layers of wire mesh (or expanded metal lath). The exterior can be covered with cement when and if cement and sand become available. pour water on the outside every couple of hours and cover the dome with a large tarp to allow for a slow cure. It the thin layer of concrete dries too fast, the surface could crack and develop leaks. If two doors are used a partition wall can be placed in the middle of the dome to make duplex dome. The Birdcage Dome above was built in the country of Burkina Faso in west central Africa. IN HOPES THAT A SENSE OF PRIVACY IS CERTAINLY THERE. 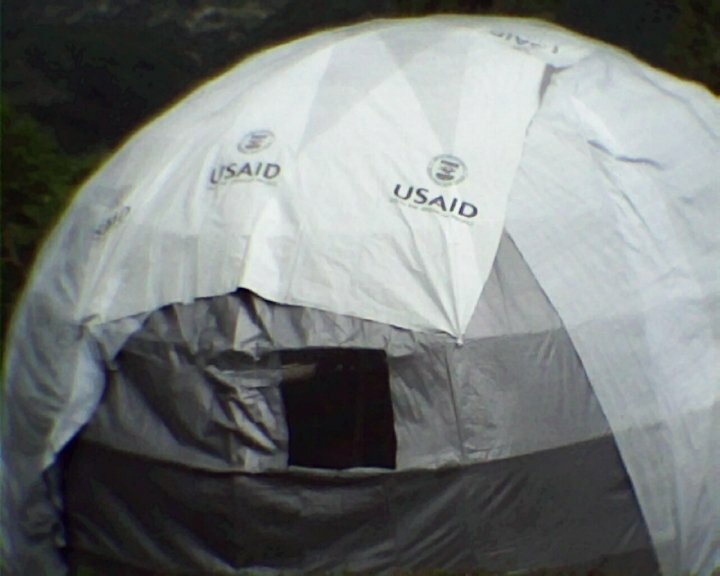 See www.haitidome.com for one example of our efforts to provide low cost homes. you will need to do some things differently. Freezing and thawing of the ground can cause unwanted building movement and must be considered in the design. Also, in climates where it gets very cold in the winter, insulation must be installed inside the concrete shell. Instead of tarps you could sandwich Reflectix insulation between layers of chicken wire. If you use rolls of reflextix insulation, put the white side inward and cut the pieces to avoid wrinkles. Also you could consider using thicker insulation and also plastering the interior. In a cold climate you may want to consider building a level concrete floor with a perimeter footing per code. Reinforce the floor and footing with rebar and let the rebar extend upward in 16 places per the plans. If you wish to have a radiantly heated concrete floor, then the floor must be isolated from the walls. Two inch "Blue Board" rigid insulation is commonly used in cold climates to insulate a concrete foundation. There are many alternatives when building in climates with cold winters. Basically, in cold climates you must either put the bottom of a concrete footing below the frostline. Or, the perimeter of the building should be supported with a wide base that rests on a river rock mesa base. Railroad tracks are a good example of heavy weights being supported by a pile of rocks. you may want to consider building with an EconOdome frame kit. 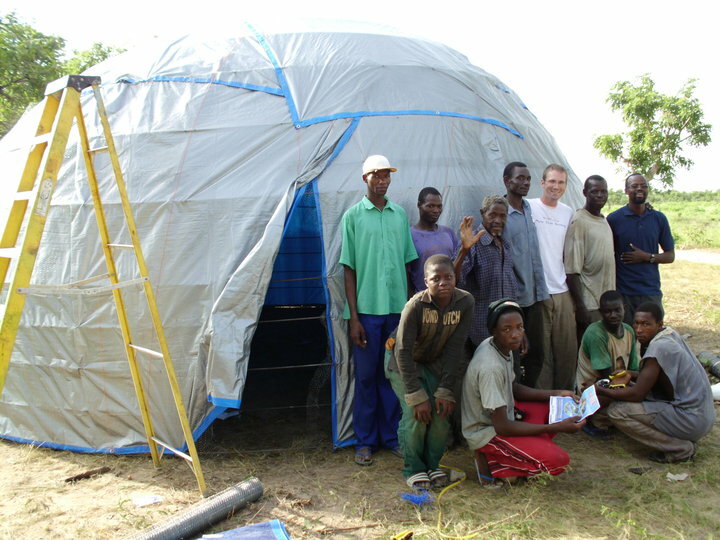 A dome home built with an EconOdome 2x4 wood frame kit can "float" on a rock mesa. 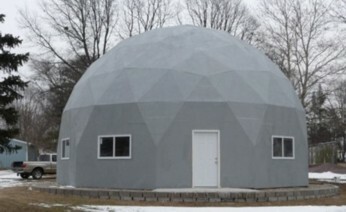 See www.kitdomes.com for dome kit pricing and details. Available sizes are 13, 24, 30, 38.5, 48, and 58 feet in diameter. The exterior covering may be made of stucco or composite roof boards. Many designs for the interior and exterior are possible. 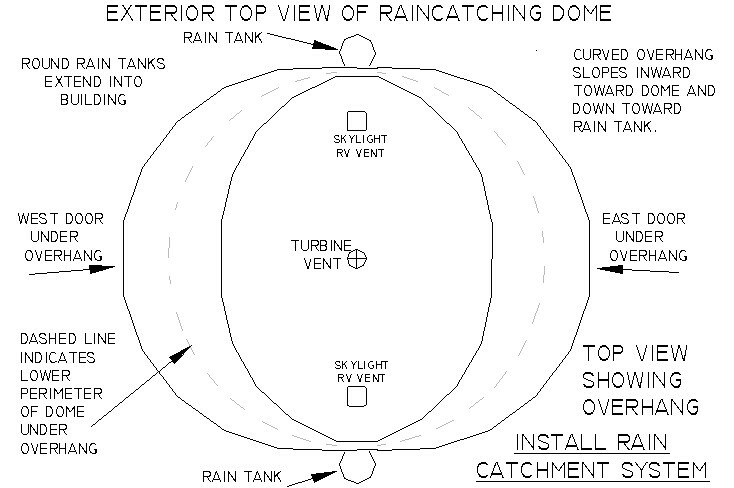 To see a complete plan set for a 30' 2-story dome home in DWG format click here. to view, measure, print, zoom, and pan DWG/CAD drawings in amazing high definition. Phone our office at 1-217-728-2184 if calling from overseas or from a cell phone. You may also wish to contact Wil Fidroeff via Skype for face to face video enabled conversations. Wil's Skype name is wil.fidroeff . On skype we can also share links, photos, and drawings to assist with your specific project. Send regular mail to Faze Change Produx, 1331 CR 1470E, Sullivan IL 61951. 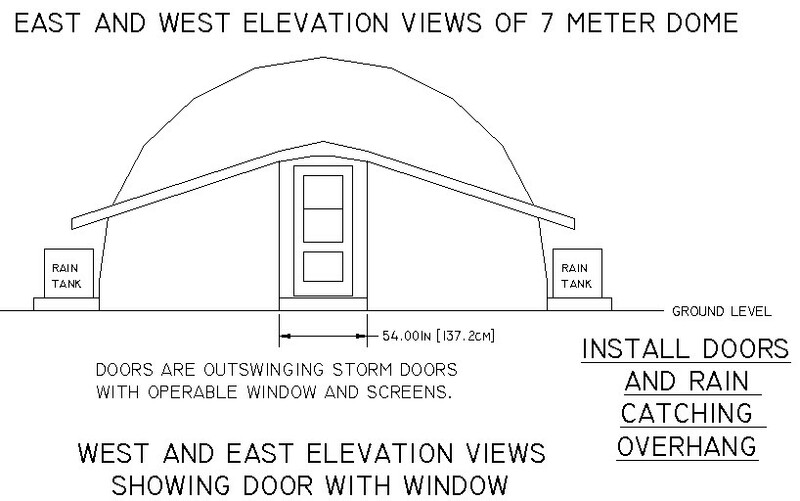 --consultation concerning construction and/or purchase of earthquake and hurricane safer dome homes.